The nearest Metro Station is University. You are on Parking (Barnes Park Road). Skip to the next section. 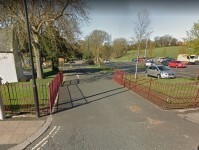 The car park is located in Barnes Park Road. The nearest Blue Badge bay is 22m (24yd 2in) from the Barnes Park Road vehicle entrance. The furthest Blue Badge bay is 28m (30yd 1ft) from the Barnes Park Road vehicle entrance. There are two spaces designated for coaches only, as shown in photograph 7. You are on Parking (Ettrick Grove). Skip to the next section. 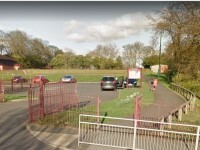 The car park is located in Ettrick Grove. The nearest Blue Badge bay is 29m (31yd 2ft) from the Ettrick Grove vehicle and pedestrian entrance. The furthest Blue Badge bay is 32m (34yd 2ft) from the Ettrick Grove vehicle and pedestrian entrance. You are on Outside Access (Durham Road Entrance). Skip to the next section. This information is for the entrance located in Durham Road. You are on Barnes Park Road Vehicle Entrance to Car Park. Skip to the next section. 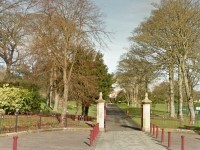 The vehicle entrance is located in Barnes Park Road and leads to the car park. There is no pathway alongside the vehicle entrance. You are on Outside Access (Barnes View Entrance 1). Skip to the next section. This information is for the entrance located in Barnes View, at the junction with Barnes Park Road. You are on Level Change (Barnes View Entrance 1). Skip to the next section. You are on Outside Access (Barnes View Entrance 2). Skip to the next section. This information is for the entrance located in Barnes View, opposite Colchester Terrace. You are on Level Change (Barnes View Entrance 2). Skip to the next section. You are on Ettrick Grove Vehicle and Pedestrian Entrance. Skip to the next section. 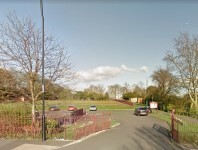 The vehicle and pedestrian entrance is located off Ettrick Grove, close to the junction with Ettrick Gardens and leads to the Ettrick Grove Car Park and the main park area. There is a pathway to the right of the road which is over 150cm in width with some uneven sections and is on an easy slope uphill. There is a gate on the pathway to which is 100cm in width, opens away from you and is heavy. You are on Outside Access (Ettrick Grove Entrance 2). Skip to the next section. This information is for the entrance located in Ettrick Grove, opposite Shrewsbury Crescent. You are on Level Change (Ettrick Grove Entrance 2). Skip to the next section. The ramp/slope is located on the path leading to the entrance and immediately beyond the entrance. There are several pieces of play equipment for children alongside the pathways in an open plan setting. You are on Accessible Toilet (Barnes Park Road). Skip to the next section. There is tactile, pictorial and written text signage on or near the toilet door. This accessible toilet is approximately 22m (24yd 2in) from the Barnes Park Road vehicle entrance. This accessible toilet is located on the left as you enter and opposite the car park. The dimensions of the accessible toilet are 220cm x 210cm (7ft 3in x 6ft 11in). There are two additional facilities next to the one surveyed, all with the same specifications. You are on Level Change (Accessible, Standard Toilets & Baby Changing Room). Skip to the next section. The ramp/slope is located on the path leading to the facilities. You are on Standard Toilet(s) (Barnes Park Road). Skip to the next section. The female and male toilet facilities that were surveyed are located on the left as you enter and opposite the car park. The female and male toilets are approximately 29m (31yd 2ft) from the Barnes Park Road vehicle entrance. There is one standard and one child toilet within the facility. You are on Baby Changing Room. Skip to the next section. The baby changing room is located next to the accessible and standard toilets. The room is 27m from the Barnes Park Road vehicle entrance. There door to the room opens towards you, is a single, heavy and 90cm in width. The baby changing table once extended is 75cm in height. The room has a standard toilet, sink and bin available. 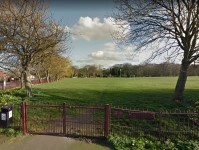 Barnes Park - Extension link (new tab) - click here. Coach House Cafe link (new tab) - click here.